There have been a number of artworks, from literature to music to art itself, that have originated in dreams - you might point to the work of Salvador Dali or Edgar Allen Poe, or famously Robert Louis Stevenson's "Jekyll and Hyde." Dreams are the meeting of the conscious and subconscious, an area of much interest to artist Kate Walters, whose latest batch of work is inspired by vivid dreams experienced whilst undertaking a series of artistic residencies at Sumburgh Head in Shetland. Perhaps Walters is more attuned than many to this kind of thing, for whilst having trained in Fine Art she is also trained in shamanism in which "dreams are considered a pure state untainted by the ego". The works here combine art and shamanism, animal and human forms, in delicate Rorscach-like watercolours of form and metamorphosis. 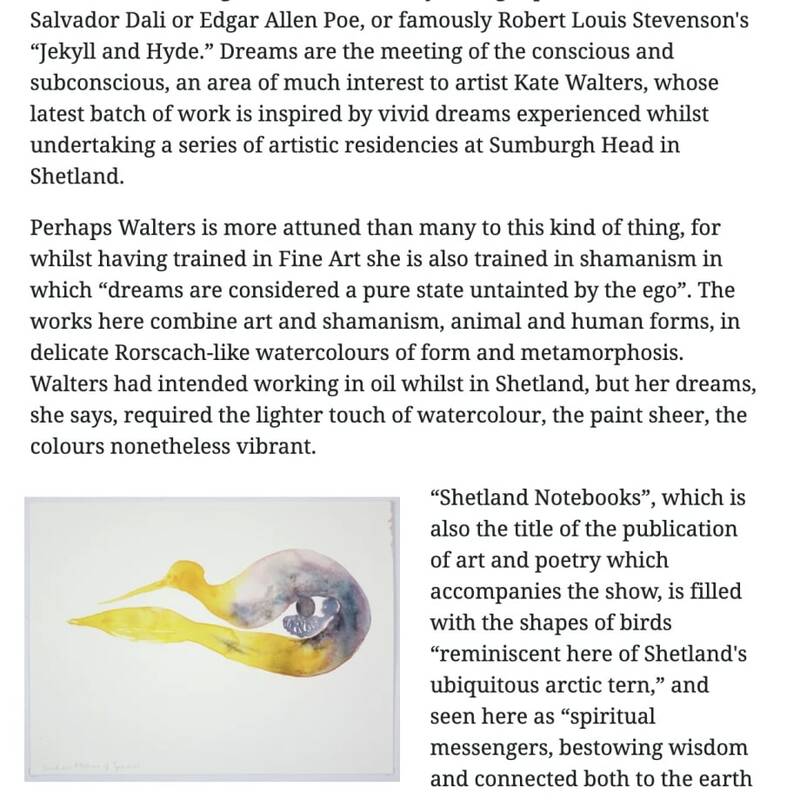 Walters had intended working in oil whilst in Shetland, but her dreams, she says, required the lighter touch of watercolour, the paint sheer, the colours nonetheless vibrant. 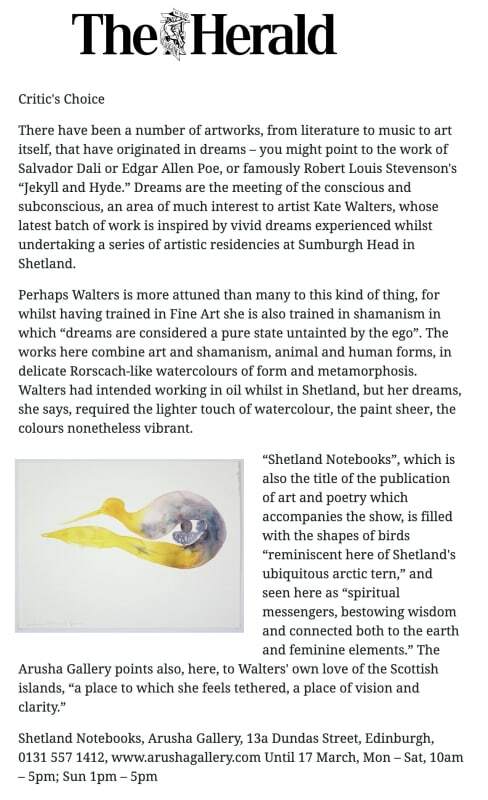 "Shetland Notebooks", which is also the title of the publication of art and poetry which accompanies the show, is filled with the shapes of birds "reminiscent here of Shetland's ubiquitous arctic tern," and seen here as "spiritual messengers, bestowing wisdom and connected both to the earth and feminine elements." The Arusha Gallery points also, here, to Walters' own love of the Scottish islands, "a place to which she feels tethered, a place of vision and clarity."